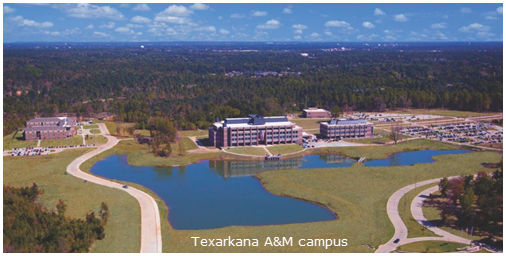 ​​​TEXARKANA – Texarkana A&M University System Board of Regents approved $32 million in funding for A&M-Texarkana's Academic and Student Services building. The 58,000-sf building will house much-needed classrooms and laboratories to meet the needs of the school's expanding enrollments. Approval by A&M regents was the final official step in the process. The $32 million for the academic and student success building was made possible in 2015 during the 84th Texas Legislative Session. During June 2016, state and area lawmakers, academic administration, and city leaders attended a groundbreaking for the academic and student success building and the 38,000-sf recreation and wellness center. Construction on the academic and student services building is expected to take about 18 months to two years. The anticipated occupancy date is spring 2019.